We are offering Aluminum Cutting Circular Sawing Machine to our clients. Length Tolerance: +/- 0.1 mm. we manufacture, export and supply a wide assortment of Aluminum Cutter. 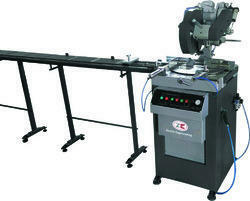 We offer wide range of Aluminium Pipe cutting machine. Owing to its unique features such as high efficiency and excellent functionality, our offered machine is highly demanded in the international market by our patrons. Our offered machine is used to cut pipe in different sizes as per the needs of our clients. We are one of the leading manufacturers of comprehensive range of aluminium cutting machines, which has high demand in paper filtration industries. These machines are manufactured using premium quality raw material that we procure from the leading vendors in the market. Further, these can also be customized as per the clients’ provided specifications. Our organization is one of the reputed manufacturers and exporters of a wide assortment of Aluminium Foil Cutting Machine. These machines are in high demand from different industries and are manufactured using high grade raw material. We offer these machines at industry leading prices to worldwide clients’ and ensure to deliver the consignment within a well defined time frame. Used for cutting profiles of aluminum windows and doors, cutting profiles of aluminum at 0 °~ 135.
hydraulic operated aluminium billet cutting machine. tungstion carbide tipped (TCT ) blade used for billet cutting. hydraulic clamping, feed and semi automatic functioning available. machine construction swing type or linear guide ways type available. fully automatic model also available. size available from 3 inch to 8 inch.